Then you see a pop up:Right click the URL and copy it. Go to you email client and add the calendar throught the URL. In Google calendar, as an example, you click in Google Calendar on “Add by URL” and past the URL from Swydo. That’s it! Your Swydo tasks now appear as tasks/events in you Calendar. Next you can optionally configure to receive notifications etc. in your Calendar app. Another really cool feature from Swydo and a next step towards becoming the default getting things done app for online marketers worldwide. 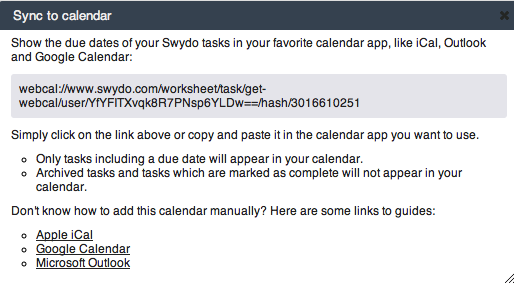 Integrate Your Swydo tasks in your Calendar. Best regards from the Swydo team and have a very nice and productive week.